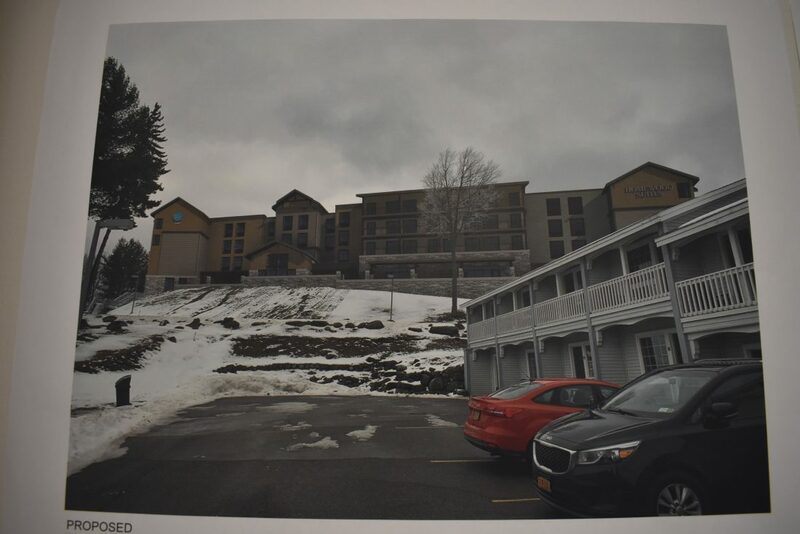 This rendering shows what a new 192-room, four-story Hilton-brand hotel could look like on the grounds of the current Quality Inn on Saranac Avenue in Lake Placid. Photos from other vantage points are on display at the North Elba Town Hall. LAKE PLACID — Saranac Avenue could get a new hotel in the future with more than double the rooms and two more stories. Dual Development LLC is looking to tear down the Quality Inn at 2125 Saranac Ave. and replace it with Tru-Homewood Suites from Hilton. The hotel would add nearly 20 feet of vertical space and contain 192 rooms. The current hotel has 92 rooms. The North Elba and Lake Placid Zoning Board of Appeals will hold a joint public hearing to discuss the project Monday, Feb. 25 at 5:30 p.m. in the North Elba Town Hall. Currently, the land use code permits buildings to reach a maximum height of 35 feet, and that’s how tall the current hotel is. The new hotel would add 19 feet. Dual Development is requesting a variance from the two boards in order to build the taller structure. A variance would not change the land code. It would apply specifically to the proposed Hilton. Because the building would be taller than what’s generally permitted, Dual had to submit edited photos of what the new hotel would look like from several different vantage points such as the Paradox Bay, the Quality Inn lower parking lot and the western corner of Algonquin Drive and Saranac Avenue. The photos can be seen in the conference room on the third flow of the town hall. From the photos, it doesn’t appear that the new building would block scenic views. Even the ZBA approves the variance, Dual will need approval from the Adirondack Park Agency, too. Any building taller than 40 ft in the Adirondacks needs APA approval. 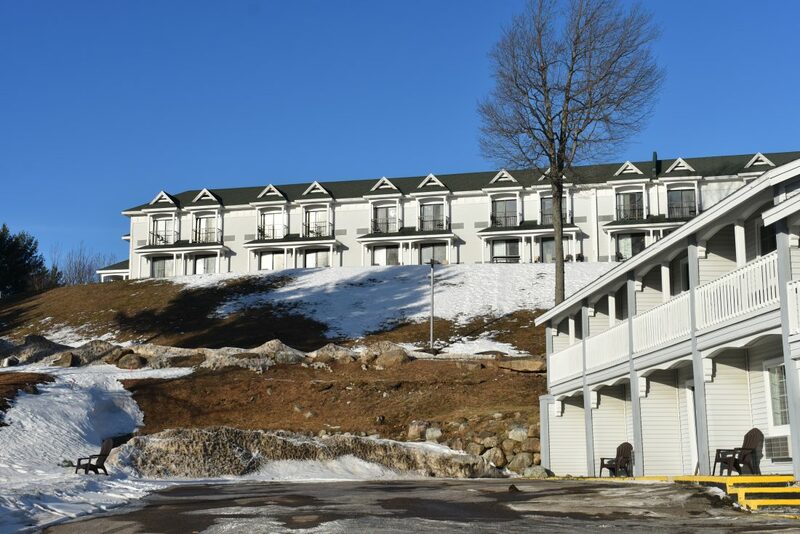 Dual Development Operation Partner Bhavik Jariwala said in a phone interview Monday the idea of the of the new hotel is to fill a void in the Lake Placid-North Elba lodging market. The new building would be a two-in-one with Homewood Suites on one end and Tru hotel on the other. Homewood Suites is geared more toward families staying multiple nights; its suites come with other amenities such as kitchens. Tru rooms are smaller and for people staying for one to two nights. Both brands fall under the Hilton chain. Jariwala said Homewood Suites prices would be comparable to a room at the Crowne Plaza and a Tru room would be cheaper. Jariwala said Dual hasn’t yet decided whether they will operate the new hotel or have another company manage the property. Dual bought the property in 2017 from the Butler Real Estate Company, owned by the local Butler family. The idea for construction is to remove the current 92-room building next to Peninsula Way Road and replace it with a new one, relatively the same footprint at 34,868 square feet. However, the new building would be taller and have a “L” shape. There are other buildings on the property, but Jariwala said Dual is focused only on the one larger structure. Limiting environmental impact is one of the goals, Jariwala said. Right now, the hotel doesn’t have a stormwater management system. It was built in the 1970s before that became a requirement. Jariwala said whatever construction Dual does, it has to comply with new requirements and install modern stormwater filtration systems. Jariwala said his company hopes to start demolition this year, and the earliest the new hotel could open would be 2022 — but that date could be pushed back. Some folks are not thrilled about the new hotel. Horst Weber, who co-owns the neighboring Wildwood on the Lake, said he’s not sure if the Hilton would negatively affect his business, but he is concerned about the size of the building. The Wildwood has a lake-water pool that connects to the Paradox Bay area of Lake Placid lake. About 50 gallons of lake water flows into the pool per minute and then flows down a waterfall on the other end. Weber said with more people in the water, it could be difficult to keep his pool clean. Next to the Wildwood is Paradox Lodge, and next to that is Placid Bay Inn on Lake Placid, and next to that is the Whiteface Lodge’s Canoe Club, all of which have access to Paradox Bay. Weber said in the past there were times when the Quality Inn would get busy, but he never had any serious problems with the business. He’s not sure what the relationship with the new one will be like in the future.